One of a number of photos sent to us by Peter Light (UK) from the family collection. Grandfater was George Nicol who owned the Essex Omnibus Company. This one relates to '1900 approx Charles & Selina Webster with Daisy & Grace'. -- Very unclear picture so not a positive identification but as the forecar seems to have a platform and the tank has carburetor bits, we think it is probably a cca 1901 Humber Forecar. Humber was first series producer of vehicles in the UK. Chrysler 1970. Interesting postcard sent to us by our member Chris Cuss (UK) from one of his friends which is showing a dog driving a car. He wanted to known the name of the dog! -- Lassie sprang to mind. 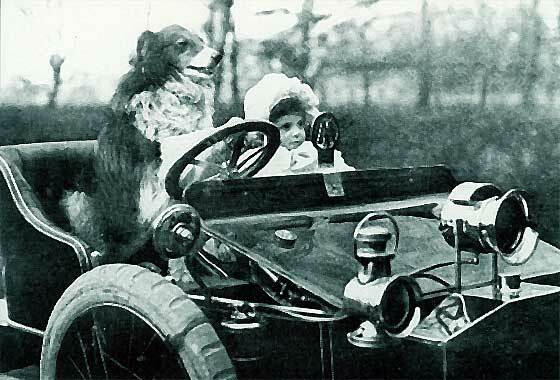 Fortunately shortly after he also supplied the answer that the car is a 1907 Riley 9HP and that the photo is a still from a 1907 Cecil Hepworth film 'Rover drives a car' where the dog rescues a child. The dog's actual name was 'Blair' and was Hepworth's. It was first cine animal to have named role. Somewhat blurred photo sent to us by Ulf Lagerkvist (Sweden) taken near Uddeholm in Sweden in 1917. We were investigating the photo without much success when Ulf came back to us saying his friend Thorbjörn Pettersson visited a very interesting old man who had the same picture in his collection. The truck is made by FEDERAL in the U.S. Later they found out that the registration number was S 200 and the owner was a person called L.P. Nordkvist from the north of Varmland. Period photo sent in by Peter Ransom (Australia) taken in Brisbane in 1914 or later, outside a local picture theatre. The car is a Delage but he asks for model and year. -- Our usual team of experts could not nail it precisely so we asked Peter Jacobs of The Delage Register for help. He advised that the badge type was introduced in 1909 and scuttle design places it not later than 1910. Probably a 4 cylinder car making it type J, L or M. Note one tyre is bald and out of the rim, and one light is broken! 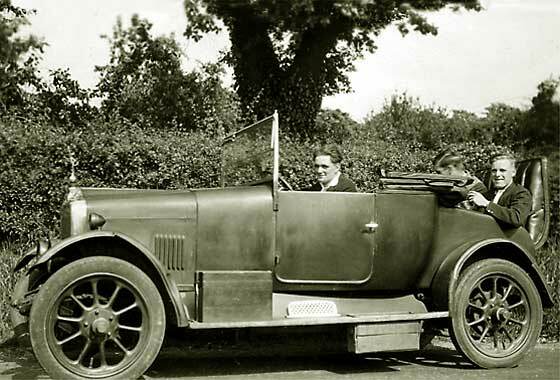 Two interesting period photographs sent in by Tony Harman (USA) whose Great-Grandfather was a driver for a rich lady and these were two of the cars he drove. He took Granddad from Main to LA in 1917. -- This a very large car indeed with three rows of seats. 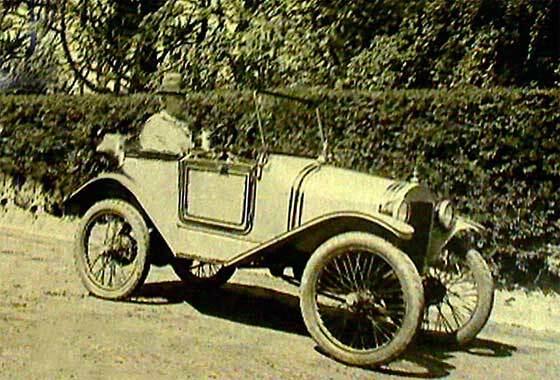 Our colleague Chris Poulsen of the AACA suggested it was an Austin and further research suggests it is a cca 1911 Austin Model 70 Tourer built in Grand Rapids Michigan, USA, - which has no connection with Austin of England. Unusual car being investigated by AutoPuzzles but one quite well known in the UK. This is a cca 1911 GN Cyclecar manufactured in Hendon in Middlesex, and designed by H.R. Godfrey and Archibald Frazer Nash. Initially wooden frame and JAP V Twin engine made in the family stables. 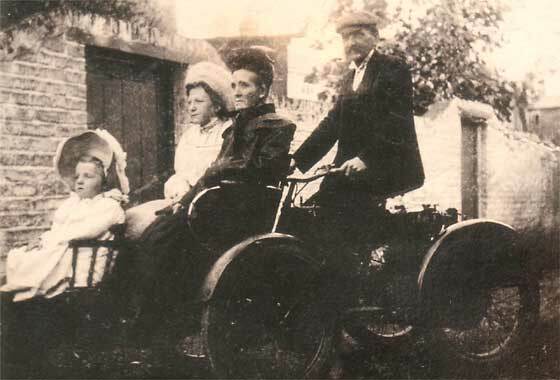 It was the first and probably best of British cyclecars achieving competition success. Purchased by British Gregoire and later licenced to French Salmson company. Two founders later had own companies. Fabulous period photograph sent by Adrian Pascu-Tulbure from a friend Radu Oltean (Romania) showing the opening of a new road in 1913 Bucharest. In 1913 there were only about 1000 cars on the road in the country, so those shown on the photo must have represented about 1% of them! -- Bad angle! Cars probably with Teutonic influence; perhaps Austria or Czechoslovakia. Different cars with similar windscreens? Reg. 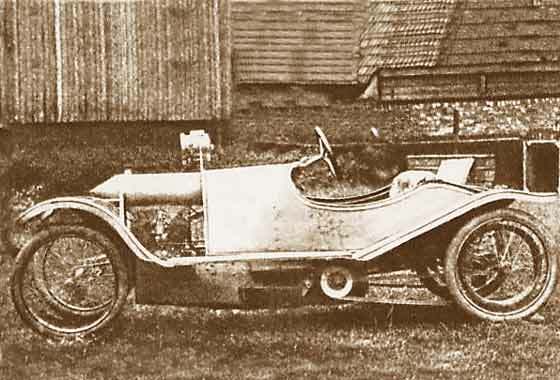 307 could be Laurin & Klement type L. Smaller car possibly French. Rather blurred photo of a photo in a family album sent in by Ian Young (New Zealand) of a car driven there by his wife's mother in 1935. -- Has all the looks of an Austin Seven but quite obviously is not. The car is American 1704cc built in Bridgeport initially as the "American" but company purchased 1914 by Trumbull Bros. Cyclecars were unpopular in USA, so exported to Europe and Australia. Isaac Trubul was lost in 1915 in the sinking of the Lucitania together with 20 cars destined for UK. Lovely period photo sent in by Arnold Edward (UK) whose wife Barbara has been researching the World War 1 VAD Hospital in Winchcombe, Gloucestershire. Can we identify the car? -- Seems normal hospitals could not cope with the wounded so Red Cross set up lots of Voluntary Aid hospitals across the UK, 30 in Gloucestershire; large residential houses, public buildings and even the grandstand at Cheltenham racecourse. Car is a cca 1915 Swift 7HP Two Seater with blackout lamps. 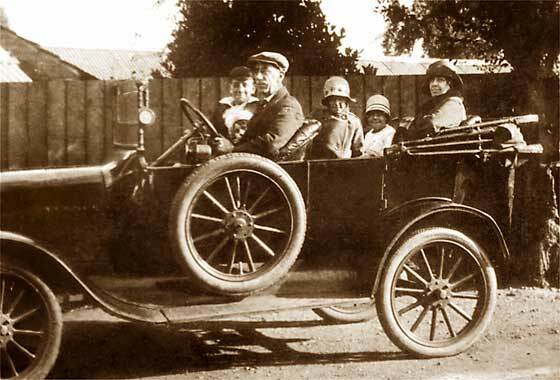 Another interesting period photographs sent in by Tony Harman (USA) whose Great-Grandfather was a driver for a rich lady. He took Granddad from Main to LA in 1917. 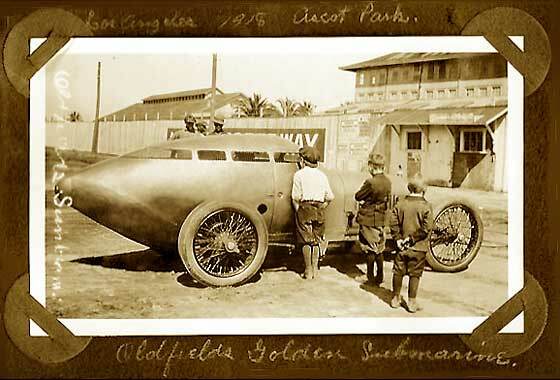 -- This one did not require identification as it is notated Los Angeles, Ascot Park, Oldfield's Golden Submarine. Built by Fred Offenhauser and Harry Miller for Barney Oldfield as first enclosed aluminium wind-tested streamliner with an internal roll cage, after his friend Bob Burman was killed in an open car. Exhibited in Ascot 1917. IDENTIFICATION AND DATING: 1917 Pathfinder 12 Cloverleaf Roadst. 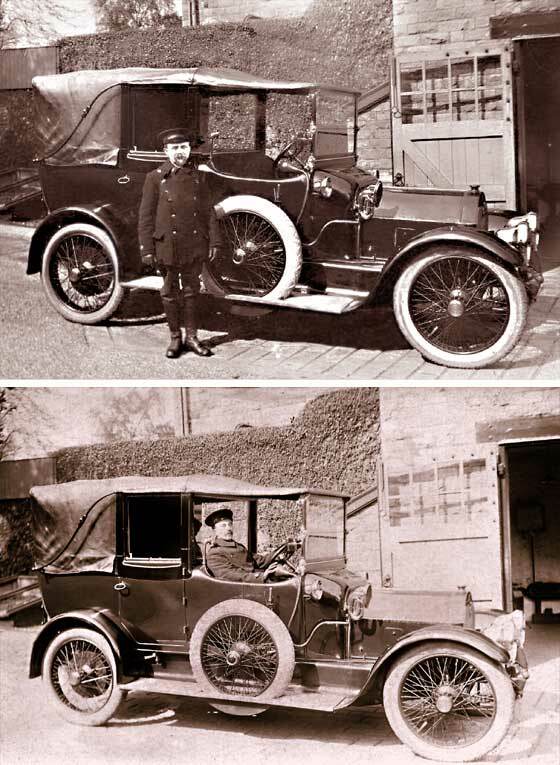 Two interesting period photographs sent in by Tony Harman (USA) whose Great-Grandfather was a driver for a rich lady and these were two of the cars he drove. He took Granddad from Main to LA in 1917. -- Very interesting car identified by our colleagues Layden and Lief of the AACA. 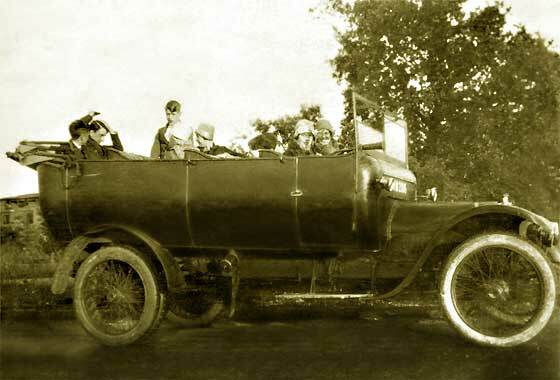 The car is a cca 1917 Pathfinder Twelve Cloverleaf Roadster with a clever back where the top folds down into the channel around the rear seat and spare is under car at back. Trip needed six others extra!! One of a number of photos sent to us by Peter Light (UK) from the family collection. This one relates to George Nicol who owned the Essex Omnibus Company in the late 1920s/early 1930s. The small charabanc HM 2006 was possibly his first commercial acquisition. His other vehicles were Leylands and a Maudslay. 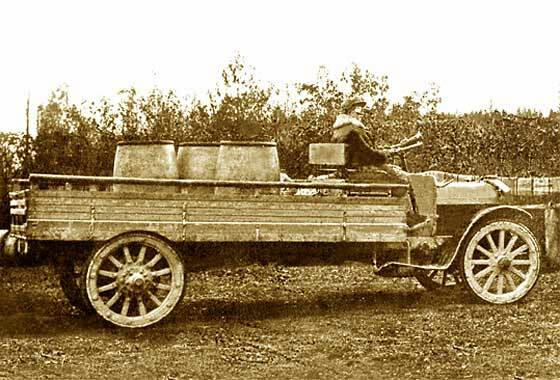 -- Our John Warburton, who had one, is confident this is a cca 1918 Crossley 20/25hp chassis, ex-WD , bodied after the war with a small charabanc body. Registered East Ham CBC. Unusual car being investigated by AutoPuzzles but one we have come across before so the unusual pointed nose was familiar. Despite the pointed nose, normally a Teutonic indicator, the car was made in Indianapolis, Indiana in the USA. This is a cca 1920 Premier 6D Touring. The oakleaf logo in 1902 was claimed as being the first emblem to represent an automobile trademark. Other claim to fame was that the cars in this period used the Cutler Hammer electrically actuated gears. One of a number of photos sent to us by Peter Light (UK) from the family collection. Grandfater was George Nicol who owned the Essex Omnibus Company. He was told by aunt, that Grandad owned a Ford, and attribution of "Ford" came from that same aunt, but she was not an expert on cars. The "Ford" photo has not been reversed - the car was left hand drive. -- She's not wrong. This is a cca 1921 Ford Model T Tourer. LH Drive so import? 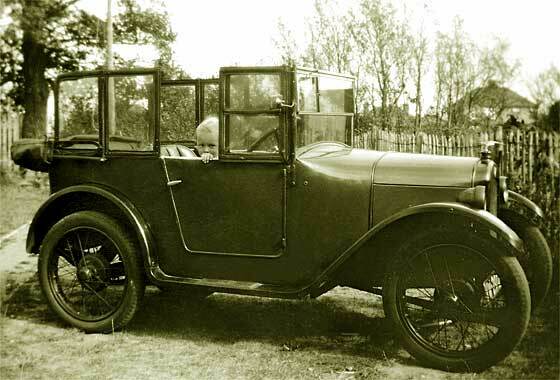 Upright windscreen dates it as pre 1923. Out of focus and shaken photo-of-a-photo sent to us by Peter Bamber (UK) Could we please identify his grandfather's first car? He is the one in the driving seat. He was born 1899, so Peter estimates the photo would be approx 1925-1930. -- Good estimate because the car is a cca 1922 Morris Cowley Tourer. Cowley was the more economical version of the Oxford and is recognisable by the 'three lamp set' where the headlamps are fitted to the mudguards, third lamp being red on back. One of a number of photos sent to us by Peter Benson (UK) showing a number of cars owned by his Grandfather Fred Benson. Peter is trying to identify and date the cars. Photos would have been taken around the mid 1940s in the UK. This car features his grandfather. -- This is quite an unusual car of which only 2,500 were made in the short existence of the company between 1913 and 1926. This is a cca 1923 Calcott 11.9 (or 13.9) Two Seater with Dickey. Earlier made roller skates and bicycles. 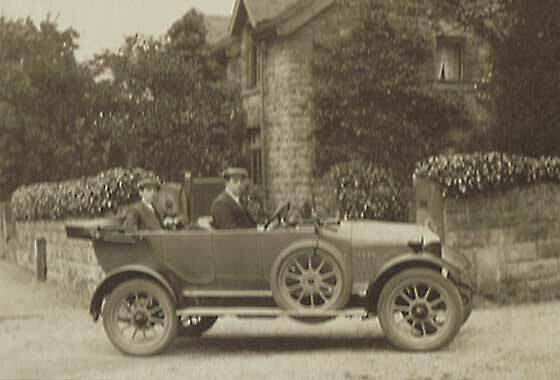 One of a number of photos sent to us by Peter Benson (UK) showing a number of cars owned by his Grandfather Fred Benson. Peter is trying to identify and date the cars. 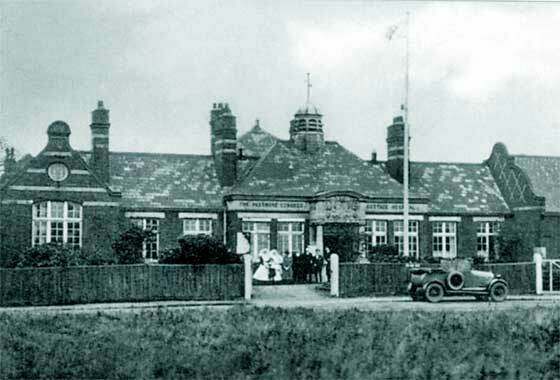 Photo shows The Passmore Edwards Cottage Hospital in Tilbury renamed Tilbury Cottage Hospital in 1924. 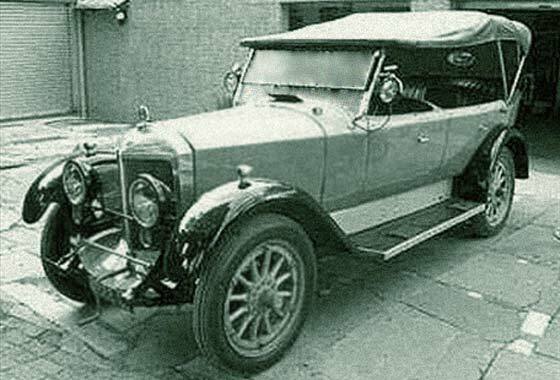 -- The photo is very small and car is blurred but consensus of opinion is that it is a cca 1923 Morris Cowley Bullnose from the headlamps on the wings. Body is unusual and it may be a 'special' four-seater 'chummy'. One of a number of photos sent to us by Peter Light (UK) from the family collection. Grandfater was George Nicol who owned the Essex Omnibus Company. -- The car proved relatively difficult to identify, although it looks easy. We could not nail it precisely but John Warburton and friends are relatively sure that Hillmans of the period have many features, wheels, bonnet, some body parts etc. in common. So we are going with early example of a cca 1926 Hillman 14 HP Saloon. One of a number of photos sent to us by Peter Benson (UK) showing a number of cars owned by his Grandfather Fred Benson. Peter is trying to identify and date the cars. 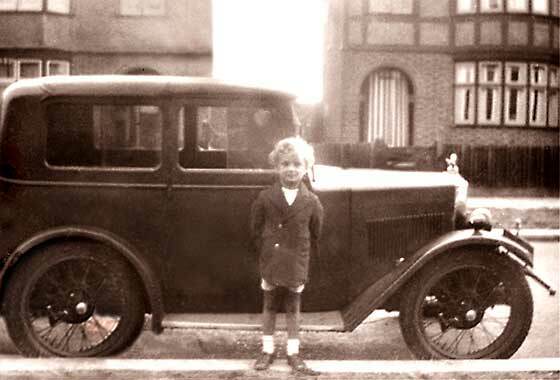 This car features his father mid 1930s in the UK. -- Our Austin Seven racer John Caddy believes this to be a cca 1927 Austin Seven AD Tourer; 26-on a four piece bonnet, external door handles, vertical in 28. 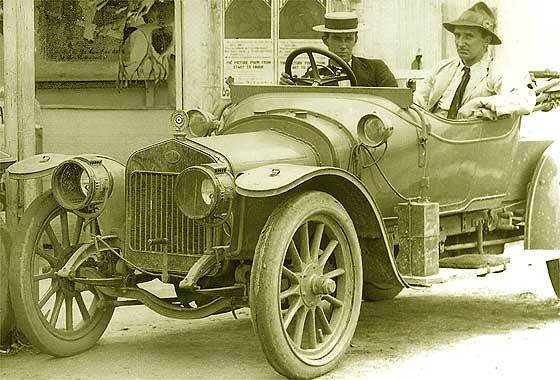 Between Sept 1926 and Jan 1927 the headlights were fitted next to the radiator after Jan 27 went back to the scuttle. One of a number of photos sent to us by Peter Benson (UK) showing a number of cars owned by his Grandfather Fred Benson. Peter is trying to identify and date the cars. 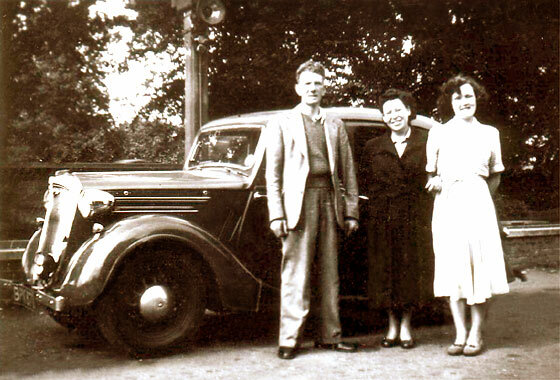 This car features his father mid 1930s in the UK. 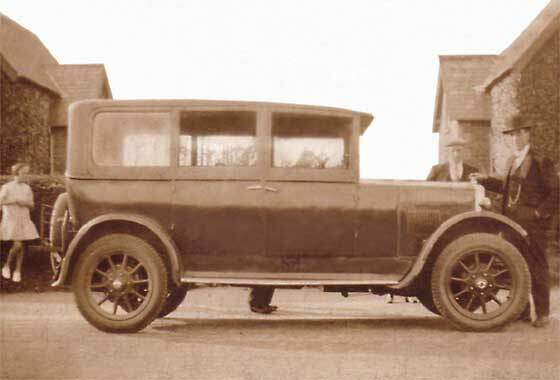 -- Our Austin Seven racer John Caddy believes this to be a late 27 or early cca 1928 Austin Seven R Saloon or, perhaps RK, as late 28 nickel rad and wider doors with mudguard cutaways. Headlamps moved scuttle to front, and due Police, back again. Non standard badge bar. One of a number of photos sent to us by Peter Benson (UK) showing a number of cars owned by his Grandfather Fred Benson. Peter is trying to identify and date the cars. Photos would have been taken around the mid 1930s in the UK. This car features his father. -- Our Morris expert Chas Moody confirmed that this is a cca 1930 Morris Minor Saloon. About 40,000 were made 1929 to 1932 and were designed belatedly to compete with the Austin Seven launched a couple of years earlier. One of a number of photos sent to us by Peter Light (UK) from the family collection. Grandfater was George Nicol who owned the Essex Omnibus Company. This one relates to 1959 and features Pauline and Elaine at Dovercourt. 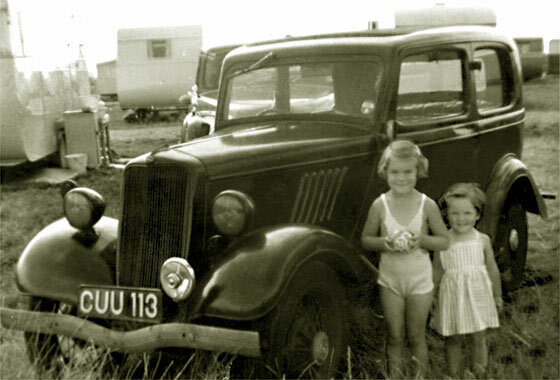 -- The car is a cca 1933 Ford Model Y Tudor Saloon surrounded by caravans so probably a camping site. Registration is CUU113 issued by London County Council in March 1936. Strange font. First true European Ford and 158,000 made between 1932 and 1937. 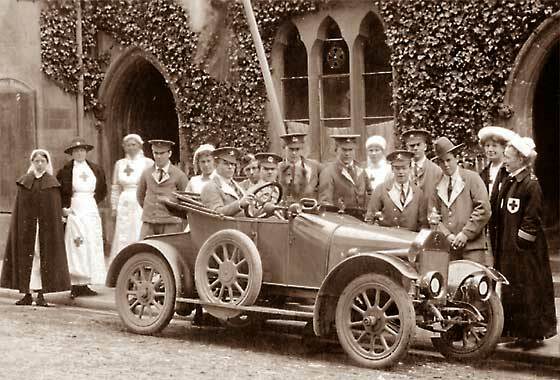 One of a number of photos sent to us by Peter Benson (UK) showing a number of cars owned by his Grandfather Fred Benson. Peter is trying to identify and date the cars. Photos would have been taken around the mid 1930s in the UK. This car features his father. 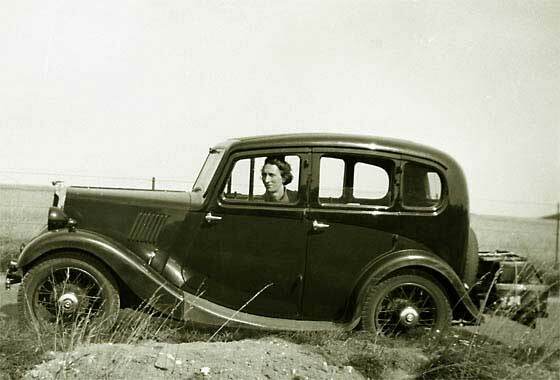 -- Our Morris expert Chas Moody confirmed that this is a cca 1936 Morris Eight Saloon. About 164,000 of Series I cars were made 1935 to 1937 and were a great success and company's savior. Mk II added a further 54,000 to 1948. One of a number of photos sent to us by Peter Light (UK) from the family collection. 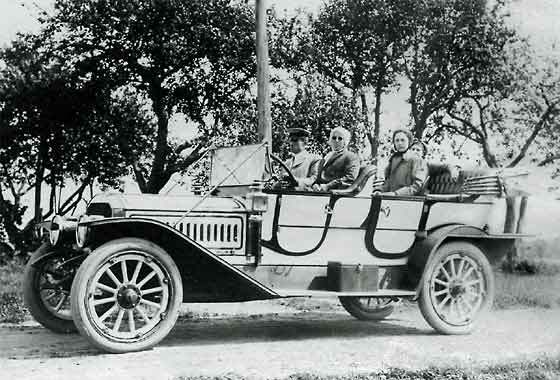 Grandfater was George Nicol who owned the Essex Omnibus Company. This one relates to '1950s, - possibly the Walsinghams'. -- The car is relatively easy to recognize but the numberplate is obscured to provide accurate dating. This is a cca 1945 Wolseley 10. These cars commenced in 1939, stopped for the war, recommenced 1945-48. Recognisable by two circular bonnet key holes. Couple of period photos sent to us by Sophie Burrows - Perth (Australia) of her Grandfather (previously a coal miner) who was a chauffeur gardener (1910-1930s) for a well known pawnbroker in Sheffield, and then later for a big grocer and tea merchants called HG Nichols. -- Enquiry had bee passed to our internal and external experts but regretfully nobody has come up with an identification. In theory the flap on the bonnet side should have been an easy feature to identify !